When will the first frost of the season occur??? Answer: .....The first frost-freeze occurred on October 16, 2008!!!! When will we get the first snow of the season??? 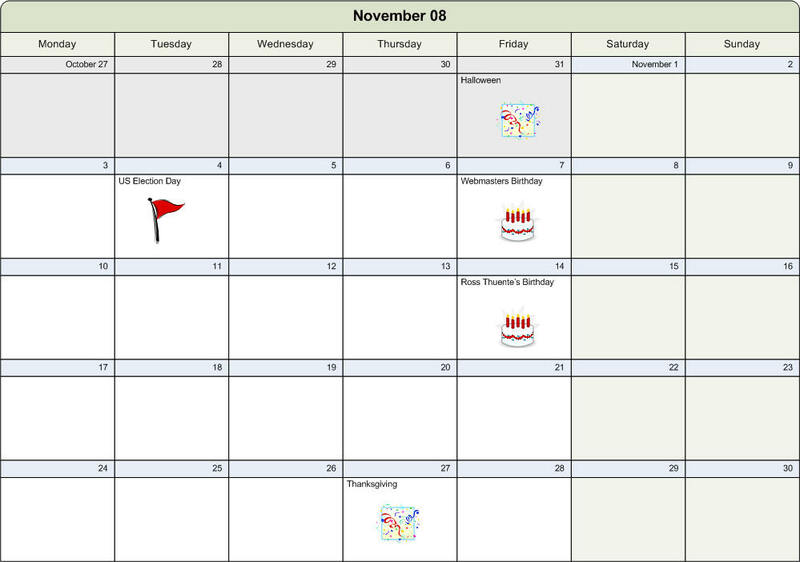 Answer: .....Sunday, November 30, 2008. A trace amount only, but enough to qualify as the first snow for the season!!!! How much snow will we get for the season??? Answer: .....The official tally for Fall 2008 stands at 7" of the white stuff!!!! For how much longer will we be able to wear shorts and other summer like clothes??? 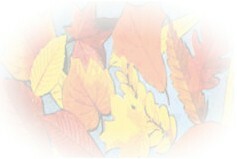 Answer: .....Early October 2008 was about the last time you wanted to be out and about wearing shorts!!!! Will Nebraska be in the College Playoff's???? Answer: .....While Nebraska is not in the hunt for the National Championship, they are playing in the Gator Bowl in Jacksonville, Florida, on January 1, 2009!!!!! Who will we be at war with????? North Korea and/or Syria or Iran???? Answer: .....With only 35 days left of his administration, Bush is fast running out of time to start a new war with anyone else. However, none of us put it past him to try and start a new war between now and January 20, 2009, when he formally hands power over to Obama!!!! What will be the body bag count from Iraq???? Answer: .....As of 12/20, the official US body count from Iraq stands at 4,210. As usual, there are no statistics available on the number or Iraqi fatalities!!!! Will there be an Iraqi government in Iraq [as opposed to the US installed government]???? Answer: .....The curious thing is that out of the chaos, the seeds of a future stable Iraqi government may be starting to form. While it is far to early see how successful it mat be, there are at least some encouraging signs!!!! How many hurricane's will we have this season??? How many more screw ups will Bush and his Republican lapdogs make of disaster relief??? Answer: .....Number of hurricanes: zero. Therefore the number of potential relief effort screw ups available : zero!!!! Who will win the US Presidential Election, Obama or McCain??? Answer: .....Obama won by a landslide with democrats increasing their majorities in the house, the senate and US state governorships!!!!! What will the US economy look like at the end of the season??? Answer: .....This one is easy. The economy keeps going from bad to worse. Unemployment is at a 25 year high (approximately 7%) and is expected to get even worse early in 2009. The credit market has al but evaporated while home foreclosures are going through the roof (people are loosing their jobs and can't get new credit). Meanwhile, the only bailouts being authorized by Bush and Co. are for the Banks (who aren't lending money), Wall Street Firms (who bear the primary responsibility for getting us into this mess in the first place) and large corporations (e.g., GM and Chrysler yesterday...only on the proviso they cut labor costs). Meanwhile, the average Joe looses his job and his house and gets no bail out from Bush. To paraphrase Bush after Hurricane Katrina in 2006....a job well done Bushie and Co!!!!!! You will go down in history as the first president Hoover of the 21st Century!!!! Yup, we have officially survived summer 2008. All going well, we will actually get a decent Fall-Autumn this year. But, as with everything in Nebraska, you never can tell what is going to happen weather wise until after it's happened!!!! Just when everything looks to be going well, blam...something happens. This time it was our dishwasher (the automatic version...not the manually operated one) wish suddenly decided that it no longer wanted to work. So, what was originally planned to be a nice quiet weekend was suddenly interrupted with having to go to Lowes and looking at dishwashers. Oh, what fun. With the activities going on over the next few weeks, we decided that we needed to replace it asap. With the webmaster going into hospital on 9/25, we did not want Lisa to have to fight with manual dishwashing as her already hectic schedule is just about to become even more hectic (if that is at all humanly possible). All we say about the new dishwasher is that it sure as hell is quiet!!!!! As some of you know, the webmaster was admitted to Creighton Hospital here in Omaha on Thursday, September 25, 2008 [9/25] for a procedure to be performed to resolve an on-going problem with GERD (Gastroesophageal reflux disease). Basically, it’s a really bad case of Acid Reflux, except for the fact the Esophagus has been almost totally corroded. A 10” section of esophagus would have to bypassed totally to eliminate the problem. The procedure to be performed in known as a “laparoscopic takedown Belsey fundoplication with short limb gastrojejuuostomy”. The procedure would be performed laparoscopically on Thursday 9/25 and, after a few days recuperation, the webmaster was to be released from hospital on Sunday, 9/28. Anyway, that was the original plan….. In reality, certain things changed. When they started the “laparoscopic takedown Belsey fundoplication with short limb gastrojejuuostomy” procedure, they discovered that proceeding with the procedure laparoscopically was not going to be possible (i.e. dangerous) because of old scar tissue damage on the esophagus. So plan B was implemented. This was to perform the procedure the old fashioned way, which involved opening the complete abdomen so they could complete the bypass procedure. What this meant was that, instead of taking only 1-2 hours, the overall procedure took about 2-5 hours. What this meant was that, rather than being released on Sunday 9/28, the webmaster was instead released late on Thursday 10/2. This, of course, increases the recuperation time the webmaster will need….from 2-4 weeks to 3-6 weeks. So, the bottom line is this: the webmaster is back at home and recovering in Omaha. The procedure appears to have gone well, but it will obviously be a few more weeks before we can conclusively say that the procedure was 100% successful. In the mean time, the webmaster is recuperating at home. During the recovery process, Stephen has had to greatly reduce the portion size of food he eats at any given seating. He is also on the powerful pain medication for the time being. 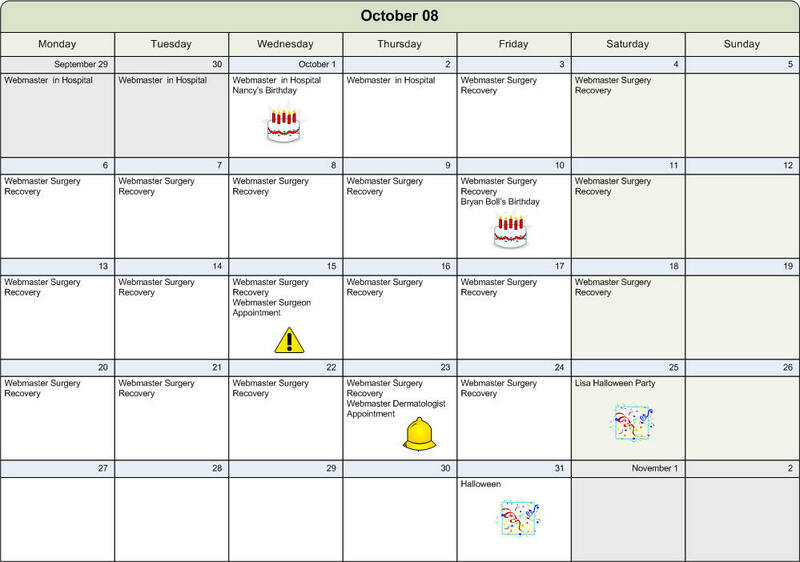 The next step in the recuperation process is to have the sutures removed (next week, 10/15). That same day we meet with the surgeon to determine where (if anywhere) we need to go next. We will obviously keep ya’ all up to date with what exactly is going on. This is a historical entry just so we can look back and remember what happened, especially for the webmaster as he was either still in hospital [see above] or recovering at home while the bulk of this happened. On Monday, September 29, the long predicted crash of the stock market happened. 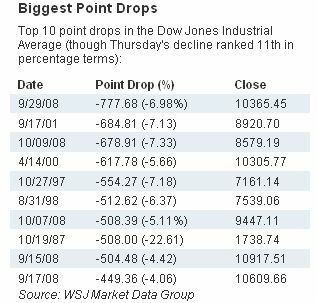 it was the largest one day drop [in numbers] the Dow Jones Industrial Average had ever experienced. In terms of some sort of historical perspective, see the two charts below. Lehman Brothers collapsed. There was no federal bailout, and shortly thereafter (i.e. within days), the entire stock market collapsed. Lack of regulation. In line with the Bush administrations complete belief in "no regulation", wall street and its Masters of the Universe were able to operate in an almost completely unregulated fashion. They invented new "investment" instruments and then happily launched them on the rest of the world in a completely unregulated fashion. Wall Street and the various financial institutions successfully lobbied congress for a decade to ensure that the SEC and other federal regulatory bodies had limited, if any, regulatory oversight of Wall Street and their new arcane "investment vehicles". Greed. the Wall Street Masters of the Universe were able to make billions for both their firms and themselves. Bad lending practices by banks from 2001. Lending major sums of money to people to obviously could not afford to repay the mortgage amount. Because there was no regulation of the CDS market [see below] used to finance these loans, there was an explosion in the number of bad loans made by various financial and non-financial institutions. Credit-Debit Swaps [CDS's]. This is the opaque and unregulated practice of bundling loans and selling them as securities to other institutions as collateral for credit. These other institutions would then in turn resell the CDS's to yet other institutions, thus spreading the exposure to bad loan debt. At the end of the day, these opaque instruments left a total liability of some US$62T (yup, that's Trillion, with the T symbol). When Lehman Brothers collapsed and exposed it's real exposure to CDS instruments, the entire CDS market collapsed. Financial instructions suddenly found themselves with trillions of liabilities. They also didn't trust other financial institutions so they stopped lending to each other, let alone consumers. Hence, we hit a credit freeze. Once the credit freeze started, the whole stinking deck of cards collapsed and rippled throughout the world. Financial institutions world wide suddenly saw there books full of worthless CDS debt and they couldn't borrow money to either write off the debts or to recapitalize their now empty books. Net result, catastrophe!!! The scary thing about all this is that it was all caused by the thirty something year old "Masters of the Universe" of Wall Street. Job losses. It is expected to be the worse since the great depression. Destruction of wealth. The Masters of the Universe destroyed an estimated $UST5-6 dollars in retirement savings in the US alone. Global impact. This has impacted every country on the face of the planet, whether they participated in the practices or not. The U.S. contagion has affected everybody. And, as stated, we have only just started to see the beginning of the full impact of this mess. The long term impact of this on the US's credibility and influence on the rest of the world is unknown, but it is surely going to be negative. After all, this collapse was generated solely in the US of A. It will be hard to describe the rage that engulfs the leaders of other developing countries as they watch the U.S. contagion decimate the economic gains of the last decade. As for the Masters of the Universe, they deserve to be in jail. At the very least, though, they have been exposed as the real dunces they are. After the webmaster's surgery on 9/25, the webmaster spent two  weeks basically bumming around the house, taking things easy so the recuperation process could proceed. On Wednesday, October 15, came the crunch time to meet with the surgeon again to receive the news if the surgery had been successful or not!!!! So, at 4pm, on the duly appointed day, both Lisa and the webmaster presented themselves for their appointment with the surgeon. After the removal of the sutures, staples and tubes that seemed to cover the webmaster's stomach, the surgeon gave his perfunctionary opinion....as far as he in concerned, and based upon the description of things by Lisa and webmaster since the surgery, everything has been a complete success. As far as he is concerned, he sees no reason to see us again, unless there are major problems. From now on, the webmasters esophagus, stomach and gastro issues are now owned by the surgeon at Creighton Hospital. At least we know who to go to if there are issues with any of the above!!!! The other change was in the number of drugs the webmaster was taking. Prior to the surgery, the webmaster was on some 5-6 different drugs every six (6) hours. You can do the math as to what that equates to. Now, the webmaster will be on only one drug a day, and this is a once a day drug for high blood pressure, which has absolutely nothing to do with the esophagus, stomach and gastro issues. [The webmaster, is however, on some additional pain medicine while he recovers...it is expected that he will stop taking this within the next week or so]. Believe us, both Lisa and the webmaster are more than happy for the webmaster to be off this six hour cycle...especially at night!!!!! We can now both get longer than six hours of sleep!!!! While a lot of you may think this reduction in the number of drugs is a "so what", to the webmaster it is huge. Some of the drugs the webmaster was on were pretty nasty, and essentially kept him in a perpetual state of grogginess [dopier than usual as Lisa would say]. With the maintenance chores complete, it was time for Lisa to prepare for her Halloween party. Lisa was going to be the only one of us going to the party....the webmaster decided a week ago that he was not strong enough to survive a party, and given the impact of the drugs he's on, probably would not have been too much company anyway. So, while Lisa went out and partied [which she deserved to do...she has been fantastic over the last number of months and more than deserves to go out and enjoy herself], the webmaster was going to stay at home and hold down the fort. Able to break a bad mood in one handful ! Able to leap past PMS with a single bag ! Able to help children read piece by yummy piece ! From what Lisa described when she returned after the party, it was a good night and a good time was had by all!!! And, that was our Halloween celebration for 2008. Yup, this was the real McCoy...Halloween. Over the last few years, the weather on Halloween Day/Night has been lousy....at a minimum, the temperature has hovered around 32ºF and the people venturing out for Trick or Treating normally have to get bundled up for the event. Instead, this year it was 70ºF (21ºC), which was most surprising. Mind you, we aren't complaining. At this time of year. we will take any good weather we can get because, it is a fact that Omaha's snow and ice weather is just around the corner and could appear at any time. So, given the weather, it was appropriate that the lawn was mown for the last time this year. Irrespective of the weather, we will not be cutting the grass again until April of next year. It was also time to clean up and cut back the old dead growth in preparation for winter. The other thing we noticed [well, the webmaster anyway] was that this year we had a lot more color associated with the changing of the color of the leaves on trees. We thinks that this has to be due to the fact that this is one of the first years we've actually had a defined "fall-autumn" season. Of late, what has happened is that we've gone from high summer to freezing winter over the course of a couple of days, so all the leaves have simply died and fallen off the trees. Not so this year, and watching the changing of the colors has been quite enjoyable. That was during the day. When it came time for the actual "official" trick or treat part of the day, the whole thing was very anti-climatic. After getting a whole bunch of candy for the kids, we only had about nine  of the little monsters knocking at our door. Talk about a let down....we'd gone to all the effort, and then no one came. Both Lisa and the webmaster put this down to the decreasing number of kids in our neighborhood. But, at least this means more candy for Lisa and the webmaster (at our current consumption, this should last us until this time 2009!!!). After the "official" trick or treat time expired, Lisa and the Webmaster were finally able to relax, have something to eat, and enjoy an otherwise very quiet Friday evening. The annual "pick a candidate to vote for" day. This is the big one....the presidential election. We find out who will replace Bush Jr. This presidential campaign also has been an exceptionally long and drawn out affair. It's know being dragging on for some two  years so just about everyone is looking forward to this being finally over!!! Also up for vote are all the seats in the House of Representatives as well as control of the US Senate. 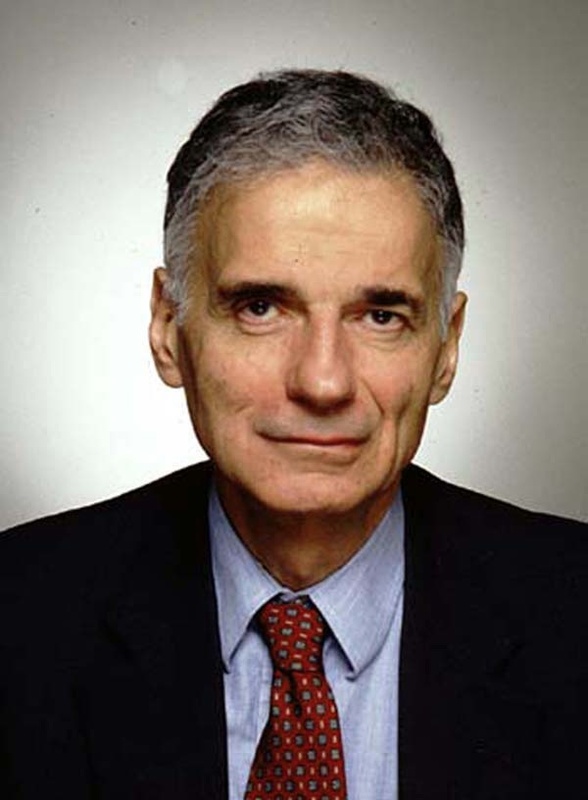 While the two main candidates are, as we all know, Barack Obama (Democrat) and John McCain (Republican), it is sometimes forgotten that Ralph Nader is also running as an independent. This could be important in a close election [as in 2000] when he took votes away from the Democrat candidate [Al Gore] and helped elect George Bush. Hopefully, there won't be a repeat performance this year!!! While there a few other candidates on the ballot for president, they are from fringe groups [such as the Alaska Independence Party] and will not play an important part in the outcome of the election. Regardless of the outcome, this election was historic. The first African American presidential candidate of a major political party. The first woman vice presidential candidate in history. The importance of the outcome cannot be minimized...it will determine what course the US takes after eight (8) disastrous years of George Bush. It will also determine how the US responds to the growing financial meltdown which has all the hallmarks as the worst since the Great Depression. The electoral college votes are current as of Thursday, December 4, 2008. The votes for the other candidates was marginal at best and did not contribute to the result outcome. The state by state breakdown in shown on the map below. There is one  senate seats still undecided. Again, we will update these tables eventually when the final information is available. There are also four  house seats still undecided. 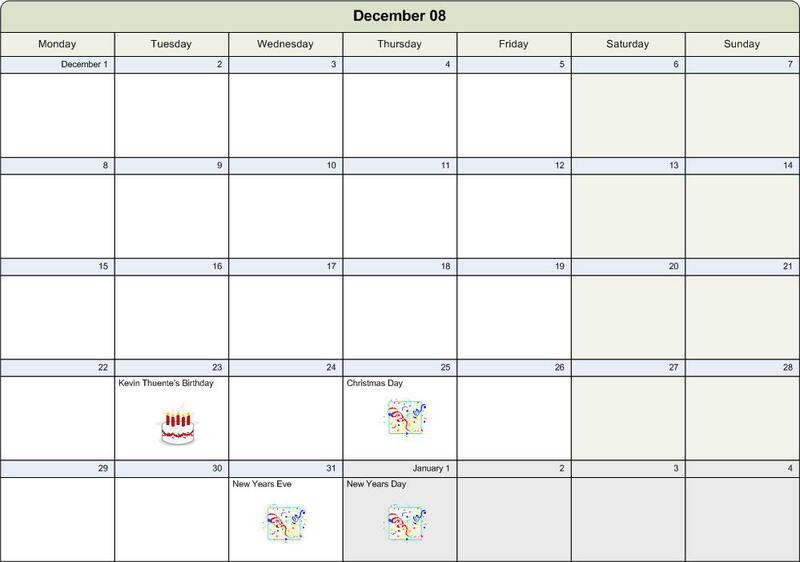 Again, all figures are accurate as of Thursday, December 4, 2008. Repudiation of the Bush Legacy. People were tired of all things Bush after eight years and McCain was too closely associated with Bush to win in this environment. The economy. People were more worried about the state of the economy rather than the traditional republican scare issues such as defense. Here, Obama had a clear advantage where people trusted him far more than they did McCain. The presence of Sarah Pallin on the Republican ticket. The vice presidential candidate appears to have been a major blunder by the McCain republican ticket. According to all the polls, she turned off women and moderate voters. Given the concern that voters had with McCain's age and the likelihood of Pallin having to stand in for him, this dislike translated into a no vote for McCain. Young and Minority voters deserted the republican party in droves. War fatigue. The American electorate was tired of two long, drawn out wars which do not appear to have any end in sight. 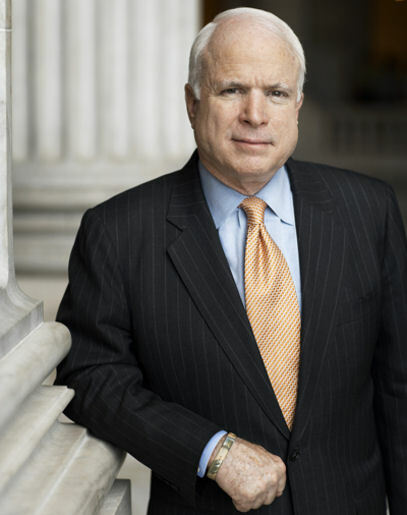 The war in Iraq, in particular, has been a loadstone for McCain and the other republicans. While the webmaster acknowledges that there are many and varied reasons of for this outcome, the bottom line is that the US electorate was tired of Bush and McCain paid the price for it. Anyway, while today was dominated by presidential election news, it was not the only thing on the webmasters mind. In following up on the changing color of the leaves [see the previous update], the webmaster decided to take some more tree photos to highlight the real color changes we are seeing here in Omaha. Some of the trees have dramatically changed the color of their leaves in the space of four (4) days since we last took some photos. Some have also completely lost their leaves in the same period of time. See, no house photos!!!! As you should be able to see from the sunny skies, the weather on election day was absolutely gorgeous. As previously stated on more than one occasion, as this is early November, we are going to enjoy the weather for as long as we can. You never know when winter will catch up with us!! Finally, the first Tuesday in November is when the Melbourne Cup Race is held down under in Melbourne, Victoria. Personally, we think that the outcome of the horse race has far more meaning that the annual election day this year. It's the webmasters birthday....and, for a second year in a row, he was actually in Omaha to celebrate it. The first thing to be said about the day was that the weather was incredibly crappy. It's called welcome to Fall....the weather is beautiful one day and winter the next. Talk about a complete change in seasons. For those of you interested, the changing of the color of the leaves in Omaha is no officially over. All the trees we've been watching (and photographing) for the last week or so have now lost their leaves. It's actually depressing as there is now very little color left...only a few evergreens have any leaves. The rest of the tree now have no leaves!!! Additional footage of the lack of tree foliage is shown in the short video which can be seen by following the link below. Anyway, that's enough of the weather, trees and leaves. So, what did we do for the Webmasters Birthday. Well, what was originally planned was to go to the best local pizza joint in Omaha [Zeo's Pizza] for a slice or two of pizza. But, at the last minute, we decided to go to Friday's because it was closer. The food was good and the webmaster got to have a Mud Slide, the first alcoholic beverage he has had since before the surgery. For those of you uninitiated, a Mud Slide is an ice cream drink that is very high on sugar. And, that is where the problems started!!!! Just as we were getting ready to leave the restaurant, the webmaster became dizzy and passed out three times. Paramedics were called [that's standard operating procedures for restaurants....it's called insurance protection] and the webmaster was then promptly carted off to hospital. The upshot was that the webmaster was suffering from a not uncommon side effect of gastric bypass surgery called "Dumping Syndrome". Basically, high levels of sugar intake can cause the stomach to "dump" it's contents into the intestines which can then cause the pancreas to dramatically lower the amount of sugar in the blood. Hence, the fainting spells. Anyway, after spending an overnight visit in hospital (where the blood sugar and potassium levels were stabilized), the webmaster was released with no further, additional side effects. Needless to say, the one thing that the webmaster is NOT allowed to have again in anything with high levels of sugar. Finally, if you are interested in what this thing called "Dumping Syndrome", follow this link. And on rolls Fall-Autumn 2008..
Ahh...gobblers day. Not a good time of year to be a turkey. You definitely now that Fall is upon you with a vengeance when Turkey Day arrives. You also know that Christmas is not too far around the corner....which means that the annual shopping frenzy is about to begin!!!! Millions of people in crowded malls....what a treat!!!. This is also the busiest travel period of the year, eclipsing Christmas with some 38.3 million Americans traveling more than 50 miles over the Thanksgiving period.....including some 25 million airline passengers. Needless to say, the airports will be crowded, made even more chaotic with the new carry-on baggage requirements and with airlines charging up the wazoo for checked luggage. But, this year, with the economy going south, everyone forecast a reduction in the number of people travelling, especially by air. Regardless of the impact of the economy on traffic volumes, it didn't worry either Lisa nor the Webmaster...they weren't travelling at all. So, at 1:30pm, with the house pretty much as "family visitor ready" as it was ever going to be, it was time to put the turkey in the oven, set the dining room table and for both Lisa and the webmaster to have their showers and get dressed. While the webmaster had been busily completing the cleaning of the house, Lisa had been busy preparing the rest of the thanksgiving banquet and temporarily storing it in the refrigerator. Needless to say, by the time the dining room table was set, the refrigerator was pretty darn full!!! Anyway, as with all the best laid plans of mice and men, things are oft to go astray. This time in the form of Lynne and Slim being early....not just on time, but actually arriving at 2:45pm!!! Needless to say, neither Lisa nor the webmaster had time to have showers, so the supposed "grand entrance" was a little bit of a shambles. But, at least the house was clean, the turkey was on and Slim and Lynne had made it across Illinois and Iowa safely and in one piece!!!! With the appetizers consumed, it was finally turkey time!!!!! It must be said that Lisa outdid herself again this year. The turkey was absolutely delicious, even if it was only an 18lb bird, rather than the 25lb bird we normally do at thanksgiving!!!! After supper (which lasted quite a while), it was time to clear the table, stack the dishwasher and change into PJ's in anticipation of spending the rest of the evening playing cards [Euchre]. For those of you interested, the boys [Slim and the Webmaster] won the initial Thanksgiving card rounds 2-1. As stated on previous years postings, this is a dubious distinction as the girls [Lisa and Lynne] normally come back the next night and whip our butts. But, for Thursday night, the honor belonged to the boys!!!!! Having had a reasonably early night, it was time to get up early on Friday to go on the obligatory shopping expedition. Well, actually, the term "early" is all relative. Early for us was about 12noon. Early for the rest of the country had started at 4am in the morning. Anyway, this year, we didn't try and do too much, basically for a number of reasons. One, no one was is in a particularly "Christmas" mood and the secondly, the webmaster was still recovering from surgery. But, Lynne was able to buy quite a few items of clothing for Lisa, which at lease meant that shopping exercise wasn't a complete waste of exercise. For the places we bounced around to, see the map below. As usual, to see the full size version, double click on the thumbnail. Anyhow, after some eight hours wondering around malls, it was time to head back home. Everyone was tired, and Slim and Lynne wanted to get on the round on Saturday nice and early. But, once home, there was one more small item that had to be taken care of....namely, one more round of cards [Euchre]. While this round was a lot closer than the previous night, the boys still ending up winning, again with the overall score of 2-1. 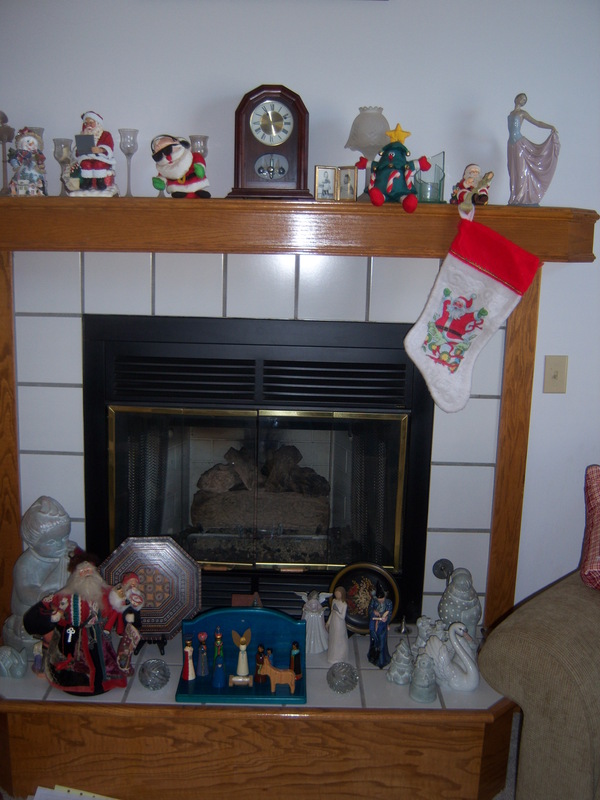 We will enjoy the temporary bragging rights because the webmaster knows that it will all change again at Christmas. Saturday dawned and everyone (the webmaster inclusive) was up nice and early as Slim and Lynne wanted to hit the road early. But first, Lynne and Lisa had to make a few stops to pick up some last minute items for Lynne. What was supposed to take an hour or so, ended up taking the best part of four hours. ; In the meantime, Slim and the webmaster amused themselves by reading the newspaper and watching the Virginia versus Virginia Tech College football game. By the time Lisa and Lynne arrived back home and we all had some lunch (leftovers), it was close to 3pm before Slim and Lynne were able to hit the road. As they had wanted to be back in Sterling before it was dark and, given that it's at least a five hour trip back to Sterling, it w ill be closer to 8pm before they get home. And that, basically, was Thanksgiving 2008. It was all over and done with so quickly. 'Tis that time of year again...Xmas!!! It's supposed to be the time of joy, merriment and celebration. Well, this year, no one either Lisa or the webmaster knew felt in a particularly "festive" mood. In fact, with all the bad economic news floating around and people losing their jobs left right and center, there is a distinct feeling of gloom and doom about Christmas. So, to try and make our house at least feel a little more "festive", the webmaster decided to out up some of our Christmas decorations. We hadn't put ant up for a number of years, but this year, dang it!!! The webmaster just had to do it!!!! And how many parties will we get to this year.......that's a fairly easy question to answer. While Lisa sent to a couple of school oriented parties, the webmaster did not go to any. About the only "Christmas" thing he did was go out for lunch with an old friend from Melbourne for a few hours. So, so much for Christmas festivities!!!! 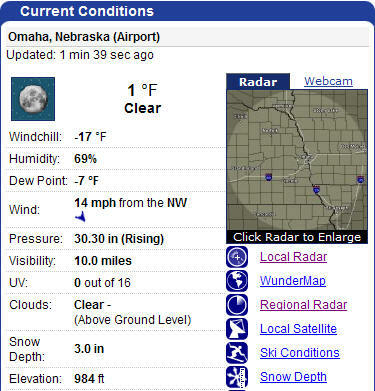 While Omaha officially received it's first snow of the season on Sunday, November 30, 2008, we hadn't really had any "measurable" amounts of snow. But, of course, being Omaha, if you don't like the weather, just wait ten minutes for things to change!!!! The weather forecasts started to change on Sunday, December 14th, when they began to forecast a major drop in temperatures, followed by a "major snow event" on Tuesday through the rest of the week. When we say they forecast a major drop in tempe7ratures, they meant it!!!! And what chaos did this mixture cause. After the initial 1-2" of ice, Omaha then received an additional 2.1" of the white stuff, plus freezing temperatures and a 45 mile an hour wind howling thought the place. It was enough to make the weather completely miserable and caused Omaha Public School district to call it's first snow day of the season. What that meant was that Lisa didn't have to go to school for day!!!! 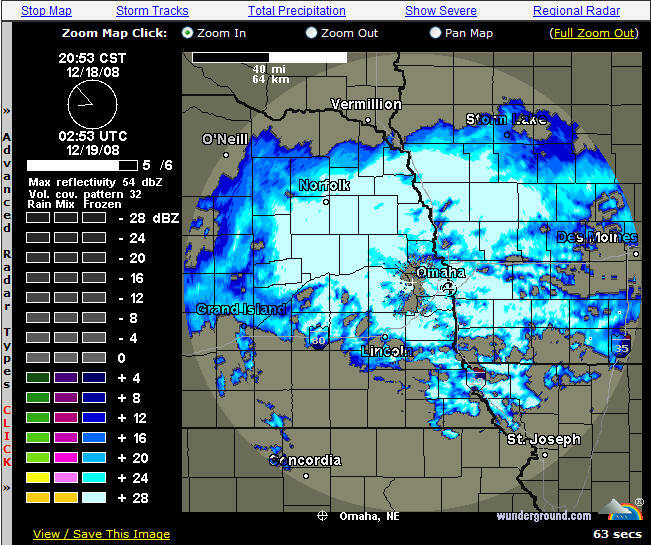 But, just when you thought it was over, Omaha threw even more snow at us [2"] over Friday night/Saturday morning. And boy did the temperatures plummet. Coupled with 40-50 mile an hour wind, it was absolutely freezing outside!!!! And that seems to be a most appropriate way of ending Fall 2008!!! We will have officially survived Fall/Autumn 2008. And on marches winter 2009!!!! As you can see, there was no travel by the Omaha Burtons during Fall-Autumn 2008. And, now, without further ado, here are the season statistics for Fall/Autumn 2008. Finally, for those of you that are really interested in the weather, here is the daily, maximum and minimum, temperatures for Omaha over Fall/Autumn 2008. So, that's pretty much our Fall/Autumn 2008. Alas therefore, this will probably be the last update for season 2008. (unless we remember something really fantastic that happened!!!). Ya'all come back, ya hear!!!! !